Politics, Intrigue, and Murder… Oh My! But the prototype can be dangerously erratic, discharging a bizarre form of mind magic—and it looks like the thief wants it for that very side effect. Worse, whoever stole the device didn’t learn about it by accident. There’s a Nokolai traitor in their midst. What I Liked: I’ve totally adjusted to the new voice of Rule Turner. Actually, that only took about 30 minutes of listening. 🙂 I also really like three of the new characters: Ghost-Al Drummond, Jasper Machek, and Alycithin. I know from the preview of Ritual Magic that Al will be back; I hope we see more of Jasper and Alycithin, too. Grandmother puts in an appearance! I love it when Grandmother is involved. I love how she bosses everyone around, too. I also liked that the Fey have sixteen words for “enemy” and seven words for “friend.” I’d love to hear more about those definitions. What I Didn’t Like: I’m noticing more and more that the GraphicAudio books are abridged–not because they are done poorly by any means; I think GA has adapted the books for production very well–but because I notice storylines that aren’t quite finished or a lack of details that I imagine would be in the book. For example, in Mortal Ties, the story never comes back to Lily’s sister, Beth, whose call starts off the story. The fey describe friendships “of the third degree” and “of the fifth degree,” but the meanings are never explained in the audio. The ending scene with Al Drummond makes me think there is more about him in the books, too. So, as much as I love listening to the GA versions, I have a feeling I’m going to have to switch to the books soon, or finish the series in GA and then reread the books. Plus the books have a glossary of characters and terms. With as wonderfully complex as Wilks’ world is getting, a glossary might be necessary! 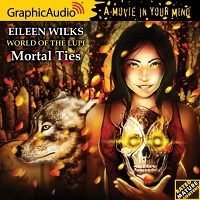 … you might try some other titles from Graphic Audio. GA has hundreds of titles in Fantasy, Urban Fantasy, Science Fiction, Horror, Adventure, Comics, and Westerns! Death Magic is a great murder mystery that moves the overall story arc forward in surprising ways. Publisher’s Description: Special Agent Lily Yu is in Washington, D.C. with her fiancé—lupi prince Rule Turner—to testify before a Senate subcommittee about her role in the magical collapse of a mountain last month. She is not there to tell them about the strange legacy she carries from that event—or about the arcane bond between her and Rule–or what her boss in Unit Twelve of the FBI’s Magical Crimes Division is really up to. She sure won’t tell them that the lupi are at war with an Old One who wants to remake humanity in her own image. Lily is managing the conflict between her duty as an officer of the law and the need for secrecy pretty well… until the rabidly anti-magic senator who chairs that committee is murdered. The line between right and wrong, always so clear to her, becomes hopelessly blurred as events catapult them all towards disaster, and prophecies of a cataclysmic end to the country she loves and serves–and to the entire race of lupi—seem well on their way to being fulfilled. 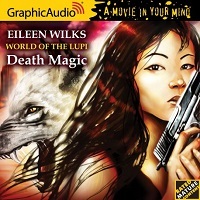 I have enjoyed all of the World of the Lupi books, but I *really* enjoyed Death Magic. I think I liked the murder mystery aspect of the story – a senator is killed and Ruben Brooks is the suspect. Go figure out who dunnit! There are also politics, a secret crime-fighting organization, and doppelgangers, which are really horrifying things, when you think about it. Lily is also dealing with the clan mantle she’s carrying, and it’s having a negative effect on her. But I LOVE how that gets resolved. I wasn’t a big fan of the Elemental storyline; however, I wonder if there is more detail in the book vs. the audio that would make that part of the story more substantial. Overall, there is a LOT happening in Death Magic. Be sure you’re caught up on the series before reading this one. …you should try some of the other Graphic Audio titles — maybe the Dante Valentine or Jill Kismet series by Lilith Saintcrow, the Goblin Trilogy by Jim C. Hines, or the Rogue Angel series. The Lady’s enemy is once again at work in the world. Lily, Rule, and everyone else is hoping they can thwart her plans one more time. Publisher’s Description: Lily Yu and Rule Turner’s engagement announcement is stirring up ugly passions in the Humans First camp. There’s hate mail. Death threats. Lily’s car is vandalized. But professionally, things are going smoothly…until a lupus in Tennessee goes on a killing spree. Okay, let me get my minor complaints out of the way before I talk about what I liked. First, the actor playing Rule’s voice changed. I KNOW there are a myriad of good reasons for changing voice actors, and with as good as GraphicAudio is, I’m guessing the situation was something outside their control. But I STILL hate it. Second, this is the first GraphicAudio book where I felt like I could tell the story was abridged. There were just some things that felt incomplete, like the explanation had been cut. Now, I’m willing to admit this could be psychological, since I just recently realized GA books ARE abridged somewhat. So take that for what it’s worth. Thankfully, I also own the ebook so I can go back and figure out if I really DID miss anything. Aside from those minor gripes, Blood Challenge is another good installment in the series. We continue to learn more about the Lupi culture, about the characters, and about they world they inhabit. Again, the world feels real because each book is dealing somewhat with the consequences of what happened in past stories. I absolutely LOVE Arjenie Fox. Her character is fantastically fun. And we get to learn more about Benedict as well. Though the entire story doesn’t focus on them, their story is a great addition and keeps the romance level up for the romance readers. Readers who get upset with the “Mary Jane” syndrome may start to get annoyed with the series, if they haven’t by now. Everything seems to happen to Rule and Lily. Rule has two mantles, now Lilly has one. The Nokolai now have two Chosen and will soon have two (or three) sets of married couples when married Lupi are unheard of. No matter where they go in the country, something big and tragic happens to Rule and Lily. The Mary Jane syndrome doesn’t bother me very much, personally; I like sticking with the same characters over time, and to keep a story interesting, THINGS have to happen to them. I see the characters as the vehicle through which we explore whatever it is we’re exploring in the series. But I know some people find it frustrating. 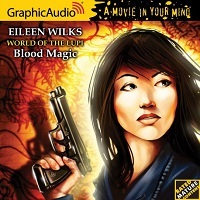 Another very enjoyable installment to the series by Eileen Wilks and GraphicAudio.net. As always, the voice acting is fantastic. Publisher’s Description: Lily Yu and Lupi prince Rule Turner have a bigger problem than their families not accepting their impending human/werewolf mixed marriage. A powerful ancient nemesis of Lily’s grandmother has come to San Diego to turn the city into a feeding ground. May I just say, I love it when Grandmother is part of the story! In Blood Magic, an enemy of grandmother’s from long ago is looking to get her revenge, which brings up all sorts of things from the past. We learn a little bit more about Grandmother and the dragon, Sam, and we learn something about the nature of Lily’s magic. For more urban fantasy romance, try the Night Huntress series by Jeaniene Frost, the Corine Solomon series by Ann Aguirre, or the Weather Warden series by Rachel Caine. Mortal Sins feels, to me, like a really good ghost story. It’s a great installment to the series. Publisher’s Description: FBI agent Lily Yu is in North Carolina with her lover and mate, Rule Turner, Lu Nuncio of the Nokolai werewolf clan. He is there to take custody of his son from the boy’s grandmother. It’s a purely personal trip until Rule, in wolf form, finds three bodies in a shallow grave. They carry the stench of death magic, which makes the murders a federal crime. Lily takes charge of the investigation and soon realizes that nothing adds up- not the motives or the main suspect, who is behind bars when death strikes again. But murder, however bizarre, is an everyday affair for Lily, who was a homicide cop before being recruited into the FBI’s Magical Crimes Division. A more personal shock arrives in the form of Rule’s son’s mother. Why would she now challenge Rule’s plan to bring his son to live among the Nokolai? But family matters must take a backseat when the violence escalates, and there’s no rhyme or reason for the next strike- by a killer who may not even be of this world. With Rule and Lily firmly a couple, Cullen and Cynna married and pregnant, and Lily on personal leave, things seem to be going as well as our group can ever expect. But, of course, wherever they go, so does trouble. In North Carolina, Lily and Rule get pulled into a ghost story that has some big implications for Rule in his dual-mantled state, so we get to learn a little more about the Leidolf clan and Rule’s position in it. North Carolina is where Rule’s son, Toby, lives with his grandmother, Louise. Louise is ready to let Toby live with his father, but Toby’s mother has other ideas. It’s a real treat to meet Louise and see more of Toby. Toby has a part to play in the mystery, and it’s great to see him growing up and learning from his dad. As always, the voice acting is amazing. I so identify these voices with these characters now that hearing the actors’ voices in a different series is a bit weird. Frequent audio listeners will tell you that consistency in voices is pretty important, especially in long-running series, and that hearing those voices elsewhere can take a little adjusting. I’ve picked up the next book already and am eager to see what happens next. I’m really looking forward to the birth of Cynna’s baby and to seeing Toby become a regular character in the series. … you’d probably like No Humans Involved by Kelley Armstrong. This book is part of her Women of the Otherworld series and has the same ghost-story feel. Amityville Horrible is a novella involving the same characters if you want a smaller taste.